Back in July, I posted on our positive and money-saving experience of booking tickets online before our trip. I figure I’d post a follow up on our success with using the online tickets, as well as our experience on riding RENFE’s trains. We bought tickets for 3 individual journeys online to connect Barcelona, Sevilla, Granada, and Madrid. Our original plan was to collect paper copies of our tickets from the self service machines at each train station. Our desire was to get “real” tickets that my wife could use to scrapbook, but we brought along paper copies from our printer at home as backup (which work just as well, as far as the conductor is concerned). It’s good we brought along the printouts, because the self service machines at the Barcelona train station did not have a clear option to change languages and certainly no option to print tickets from an advanced purchase (although this is supposedly available). With little time before our departure, we decided to forego the “real” tickets and head straight to the train. Our first train connected Barcelona with Sevilla. RENFE offers 2 daily high-speed AVE trains that connect Barcelona and Sevilla without requiring a train change in Madrid. We took the early morning one. In addition to the confusion around using the self service machine, we also had difficulty orienting ourselves in the Barcelona Sants station. The main floor is dominated by monitors and signs for the many local trains passing through the station. The AVE is located downstairs, and required us to make a complete U-Turn after entering the station. The AVE platforms are isolated from the rest of the station, and require passengers to present their tickets and pass bags through an x-ray to enter. Make sure you get any food and complete all shopping before entering the AVE platforms, which were sparse on amenities. The basement platforms were extremely hot and appears to have no ventilation. If you know where you are going, it probably only takes 5 minutes from entering the station. If you struggle, plan on at least another 5 minutes. However, if you arrive early, also plan on spending some time in the hot basement. Once on our way, the journey on the high-speed AVE was very pleasant. We rode in economy class, which has just slightly less space and did not include food or drink. In both classes, they played a popular movie on the screens in each car, complete with a english audio station and provided headphones. A cafeteria car offers a modest selection of sandwiches, beverages, and other snacks. They can heat up many of their items, including a ham and cheese sandwich we enjoyed. The train arrived right on-time. We had similar experiences on our remaining two train trips, except that perhaps the stations at Sevilla and Granada are much easier to navigate. Our train from Sevilla to Granada was a short-distance regional train, which travelled much slower than the AVE, but was similarly modern. Our connection from Granada to Madrid actually involved a gauge switch (width of wheels/tracks) halfway through at Antequera to allow the second half of our journey to continue at high speeds on the dedicated AVE rails. They are currently building a high-speed connection from Antequera to Granada, to allow the entire journey to Granada from Madrid, and eventually from Sevilla, to be completed on high-speed rail. The line is expected to be completed as soon as 2013. As a rail aficionado, it was a thrill to see the construction of 100-foot tall viaducts and tunnels for the new high-speed line, while paralleling it on the regional rail line. After returning home, I found a good page on Adif, the Spanish rail infrastructure company, describing the project. Compared to the delay we experienced with our air connection from Lisbon to Barcelona and the hassle of getting to airports that are generally far outside the city limits, our travel on Spain’s trains was a breeze. Rail isn’t as cost competitive as you’d expect with other options, especially if you don’t book ahead. However, the relative comfort and convenience can’t be beat. This is especially true on high-speed lines that are becoming more and more popular in Europe, especially in Spain. 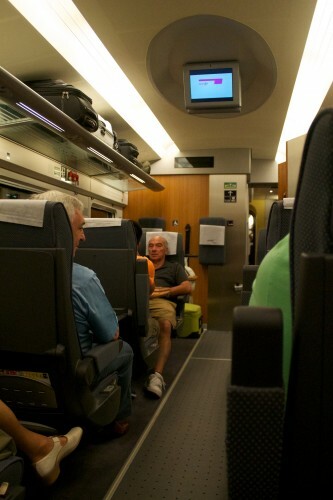 This entry was posted in Travel and tagged Europe, Portugal/Spain 2012 Trip, Spain, trains, transportation by Ryan. Bookmark the permalink.